Competition has wrapped up for the second season of the KCA Jays Care Rookie League, featuring teams from eight northwestern Ontario First Nations. Faith Cameron sits at the end of the dugout bench at one of the Kenora Recreation Centre's baseball diamonds, clipboard in-hand, as she calls out the names of the next three batters due up. 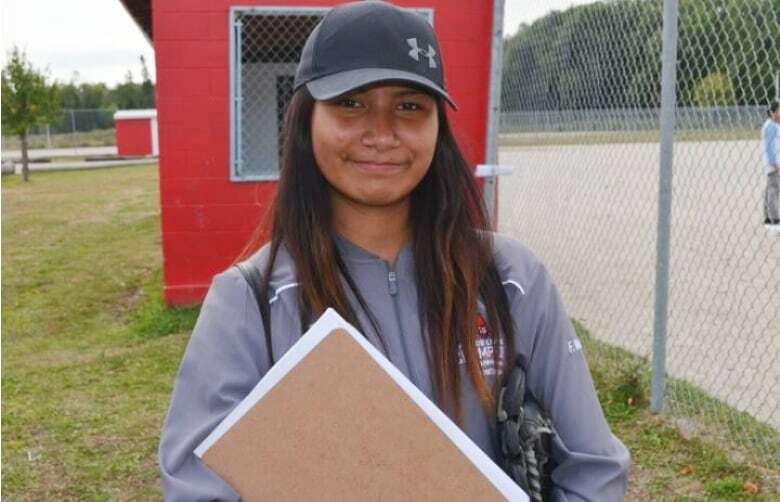 Cameron, an 18-year-old from Wabaseemoong First Nation in northwestern Ontario — also known as Whitedog — has only been playing softball for a couple of years, but she's in Kenora on an early September day, playing for, and helping coach, the Whitedog Thunderhawks. 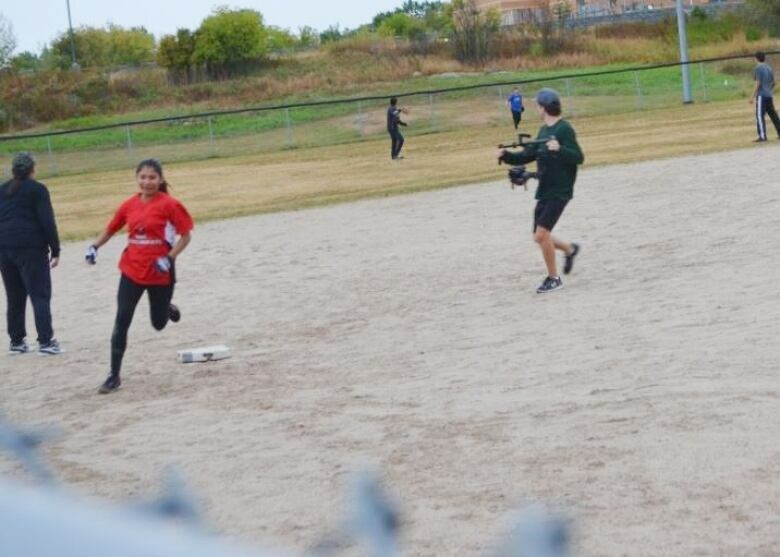 The team plays in the KCA Jays Care Rookie League, a two-month-long summer slow-pitch softball circuit featuring squads from eight First Nations in Treaty 3 territory. "In my reserve, we play a lot of baseball, like scrimmages, tournaments in the summer because, I don't know, everyone just loves it, finds passion about it," she said. The teams come from eight Indigenous communities around Kenora, a city of about 15,000 people located 500 kilometres west of Thunder Bay. During the season, they travel to each other's communities, or to Kenora, for the games, with the September tournament crowning an on-field champion. The tournament in Kenora is the culmination of the Rookie League season. Wins and losses matter here, but not so much during the season. Teams earn points throughout the summer by demonstrating skills off the field, like bringing fans out to games, hosting community barbecues for visiting squads and holding regular practices between games, where youth can learn the sport and have fun. The prize for the off-the-field winners: a trip to Toronto to see the Blue Jays. Each First Nation fields two squads, a junior team of players age 12 and under and a senior team for teens and young adults. Coaches and community boosters volunteer their time to help out. Teams generally play two to three games per week. "The best thing about this league is just showing the fact that everyone has sportsmanship, positive attitude," Cameron said. "Just like seeing the [laughter] and smiles just makes me happy." Cameron, a senior at Mizhakiiwetung Memorial School in Wabaseemoong, said she really "did find myself playing sports," as a young teen, taking up volleyball at school. That led to a love of baseball when, prior to last year's summer season, a few friends convinced her to step up to the plate. "I didn't know who I was until I started playing volleyball and baseball," she said. "I just love playing sports and hanging out with people." On the field, Cameron appears to have taken to the sport quickly. She credited her dad with helping her learn the game once she decided she wanted to play. Already in a leadership role on her senior squad, Cameron said she wants to take that a step further next year and coach her community's juniors. Being a mentor, the teen said, is something very important to her. "I have always wanted to be a leader for the youth and I want the youth to become their own people," she said. "I want to support them to lead their path to whatever they want to be." Playing sports and learning in a positive environment, Cameron said, can make that happen. "We'll tell them what to do, how the game is played; how to catch, how to bat," she said of her coaching philosophy, but also "don't try to be like someone else." Bringing people and families together, not only within each participating community, but also between area First Nations, was at the core of establishing the league, according to organizers. The league is a partnership between the Kenora Chiefs Advisory — a council that provides health and social services to its member First Nations — Right To Play and Jays Care, the charity foundation of the Toronto Blue Jays. "It was all about having fun and bringing our families together and our communities together and being active," said Lorraine Cobiness, the president of the Kenora chiefs and the chief of Ochiichagwe'Babigo'Ining, or Dalles First Nation. "It's priceless; it just makes us that much stronger and it makes their connections stronger and it helps them identify with who they are and celebrate that." Elders from several First Nations in the area have given political and social leaders in the communities "very clear direction," to form partnerships aimed at building these types of opportunities that help youth and the communities at-large, Cobiness said. The league's success so far is due in large part to how people from the communities have bought in, Cobiness added. Nigel Cameron is one of those committed volunteers. So much so, he was one of two people recognized after the tournament for his dedication during the season. He and his wife play many roles as volunteers for the league, like coaching, spearheading community barbecues and generally organizing a day's worth of activities when visiting teams travel to Dalles First Nation to play the Stars. "Growing up when I was younger, we never had something like this," he said. "So I just kind of want to take a role in it, give the kids a chance and an opportunity." "It's a good feeling," he continued. "I enjoy it ... when I'm spending my times with the kids and everything, it just kind of opens me up more to the kids." Travelling to the other First Nations helps with those bonds, he said. "We try to have fun and everything with the kids ... try to keep them motivated when they're not playing the game." Over 140 athletes played in the league in 2018, according to organizers and kids make up a sizeable portion of that number. For Lillianna, Zeveah and Novah White from Naotkamegwanning (Whitefish Bay), it's a chance for three cousins to share time during the summer playing a sport they love. "When I was younger, I used to play [baseball] but then I started to do other sports like hockey and soccer," 10-year-old Zeveah White said. "They were fun too, but this year, for Rookie [League], it has been excellent." "You can see new people ... and then you guys can just do teamwork most of the time," she continued. "It's mostly just really, really fun." While some of the road trips can be a bit long, nine-year-old Lillianna White said the overall experience was positive. "You get to rest before the game starts so you can get a little head start before you start the game," she said. Asked if they want to play next season, all three let out a resounding "yes!" Fans that come out to the games provide a fun, energetic atmosphere that makes the whole experience enjoyable, according to Ian Crow. 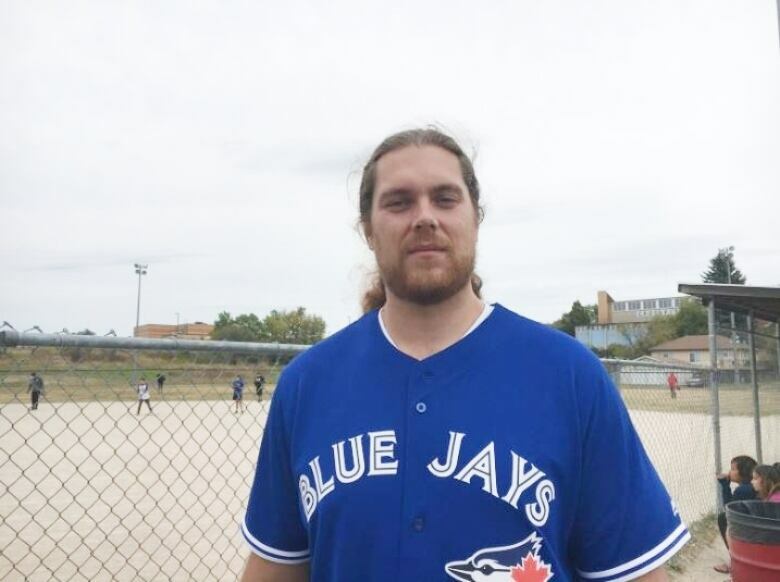 Crow is one of the volunteer coaches with the Whitefish Bay Winter Hawks. It's his first year in that role after watching his two children play for the team over the past two seasons. "It's very nice to see [the other communities] host because they bring in the food, they bring in the fans, they cheer for both teams," he said. "The kids are excited about that too, knowing that they don't know the people who are cheering for them." "It makes the game so much more exciting." Crow, who also works at the Baibombeh Anishinabe School in Naotkamegwanning, said the league provides a unique opportunity to entertain and teach. The language — it's one of the things that we ... try to do as coaches is use the language," he said. "For example babaamaadagaakobatoo means 'run' so the kids know that and each team, they know, OK, now we're speaking Ojibway right here in Treaty 3 and they like that part of incorporating the language with the game of baseball." Crow's community has been all-in with the tournament, he said. In fact, it's already becoming a summertime staple. "We do have kids who enjoy the game, we watch the Major League Baseball on television, some of them go to the games in Toronto ... we're all involved in, since the beginning, day one," he said. "When Whitefish Bay calls for practice, the kids are there for practice. They're aware." Reclaiming that language is just one part of the strengthening of community that Lorraine Cobiness said was at the core of the Kenora Chiefs Advisory's decision to pursue setting the league up. "We need to be strong as a people," she said. "We need to start with, if we're going to preach it, teach it, talk it, we gotta live it." "That's what we need to do, we need to lead by doing it, by living it and breathing it, or [it's] just a bunch of words." The league's central concept and its goals appear to be spreading. The Kenora tournament champion is scheduled to travel to Winnipeg in October to play the champions of a similar league set up in Saskatchewan, consisting of teams from the File Hills Qu'Appelle Tribal Council. "The Jays Care loved what we did so much here that they actually decided to recreate what we've done here in the communities in Saskatchewan," coordinator Mike Luby said. "It's a really good feeling and it all started like a vision with Jays Care and the chiefs and just like, all the communities ... just wanting something more concrete for the youth." "It's just great that it's spreading." 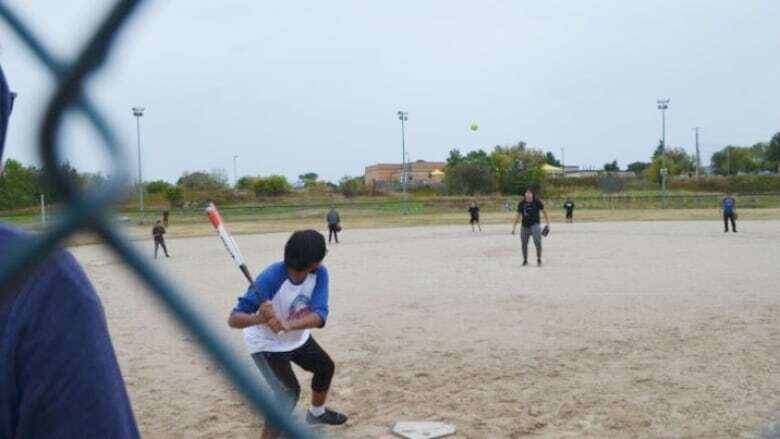 Within the Treaty 3 communities, organizers and participants are also batting around ideas on how to expand the league, like possibly adding a separate women's division, playing junior and senior games on different days and potentially adding fast-pitch baseball and softball. Luby said he wants to see the idea spread further — from coast to coast to coast. "My dream is that it goes across the whole country and I believe it will," he said. "Sports can kinda take you from any situation and give you a home away from home and just inspire youth to do better." That points to the league being around for awhile. That's something that Ian Crow said has to happen. "Some of the kids here are playing, they're very young — five years old even six years old — and we want that opportunity for them when they're 10, 15, 16 years old." The day-long tournament in Kenora started with a breakfast and opening ceremonies, which featured a traditional drum group, speeches from local dignitaries, members of provincial and federal government and a special message from a former Major League Baseball player. Reggie Abercrombie played three seasons in the big leagues for the Florida Marlins and Houston Astros. The Columbus, Ga., native now plays just across the Ontario-Manitoba border for the Winnipeg Goldeyes. What Abercrombie has seen of the league has impressed him, particularly "how the elders and everybody's come together in this community." "That lets you know they care here and that lets you know that the kids are, they're seeing change," he continued. "They want to go out here and be better in life and anytime you've got that, it's a wonderful thing." The former big-leaguer was a hit with the kids; he spent a good portion of the day going between Kenora's three ball diamonds checking out the on-field action, where he was often asked to pose for selfies with excited players. "Baseball brings a lot of people together," Abercrombie said. "No matter what race, what colour, whatever we are, baseball brings a lot of things together." After the opening ceremonies and a long day of baseball, many participants reconvened for dinner and awards. On the field, Faith Cameron's Whitedog Thunderhawks carried the day, defeating Dalles in the finals. The community's junior squad also won. But many other participants were also recognized; organizers handed out hardware for each team's most dedicated, most improved and most sportsmanlike players. And, of course, came the unveiling of who won the trip to Toronto for demonstrating throughout the season all the positive attributes the league holds at its core. That honour went to the Wash Bay Wolves from Obashkaandagaang (Washagamis Bay). While the league winds down for another season, hundreds of players, coaches, volunteers and other community supporters, separated by northwestern Ontario's vast geography look forward to another year. For Faith Cameron — who also wants to run volleyball practices in her community for girls wanting to get into the sport — her message is simple. "If anyone has problems with their self-esteem with sports like 'oh, I'm not good enough' or 'I can't do this because I'm not good at it,' it's just like keep training," she said. "Don't listen to what anyone says, just keep doing you, that's all that matters."